A grand jury’s conclusion that “San Francisco’s City Technology Needs a Culture Shock” inadvertently points toward opportunities for those of us involved in workplace learning and performance (staff training) endeavors regardless of where we are living. 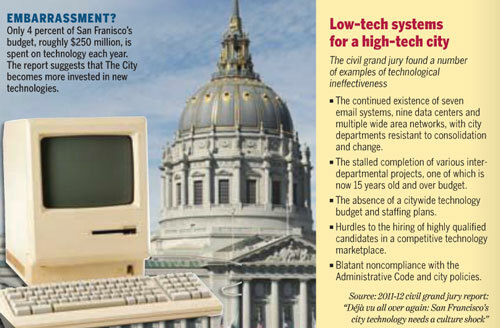 “Déjà Vu All Over Again,” the recently-released City and County of San Francisco Civil Grand Jury report, documents the deplorable state of technology coordination and usage at the local government level. And this clearly is not a new or local issue; those of us who follow tech news have seen numerous examples of how our colleagues in government struggle—or don’t even attempt—to effectively incorporate the use of available technology into the workplace to better serve constituents. Think of the situation that led to the formation of the United States Department of Homeland Security when it was clear that the FBI, CIA, and others were far from up to date in their use of effective communication tools and practices. Or think of the sort of reports that have consistently documented the need for tech upgrades at the national level over the past decade or two. And think of what we see among our own workplace learning and performance colleagues if they still haven’t begun to build upon the practices documented by Tony Bingham and Marcia Conner in The New Social Learning, in the American Society for Training & Development (ASTD) Social Media Toolkit for ASTD Chapter Leaders, or the other resources that continue to come our way on a regular basis. While the San Francisco Civil Grand Jury report deals primarily with the situation here in San Francisco at a high-level administrative level (the fact that seven different email systems are in use among City/County departments, for example), it also speaks to anyone involved in training-teaching-learning through its occasional—and, unfortunately, infrequent—references to the need for staff training. The fact is, the report is heavy on identifying and criticizing political leaders and chief information officers throughout the City and County of San Francisco for not working more cohesively and collaboratively to meet the tech challenges that face many of us on a daily basis, but is light on acknowledging the role teacher-trainer-learners might be playing in remedying the problems identified within the report and better preparing managers and employees to use the tech tools at their disposal. Sparse references to providing training or staffing help desks means that the focus here remains on the acquisition of tech systems while underplaying the importance of assuring that those tasked with using those systems are prepared to fully incorporate them into the work of serving constituents. And this is where I believe we can all be doing better in being part of the solution. We need to continue carving out the time to be technologically literate. We need to be playing more of a leadership role in our organizations to help determine the learning course of those organizations rather than just working to implement what others have, for better or for worse, determined are our workplace learning and performance priorities. We need to be collaborating even more effectively than we already are through our professional associations, through the onsite and online learning opportunities that we often ignore because we just can’t seem to make the time to take advantage of them. And we need to be positioning ourselves—to the benefit of our organizations and those they serve, not just for self-promotion—in ways that show we should and can be key players in making decisions that help resolve the sort of tech (and learning) deficiencies that are at the center of that grand jury report. If we continue advocating for creative, cost-effective ways to support our colleagues to meet their learning needs, we provide the foundations for the sort of tech-savvy workforce that, as ASTD so often says, creates a world that works better. If, through our own training-teaching-learning efforts, we provide examples of how this can be accomplished, we become part of the solution. And, if we’re lucky, we help nurture exactly the sort of culture shock that San Francisco and other municipalities so clearly need in a world where change and learning are constant. Members of that rapidly-growing training and leadership group—which is sponsored by the ASTD Mount Diablo Chapter and is open free of charge to workplace learning and performance professionals throughout the San Francisco Bay Area—began our June meeting with a broad-based discussion of the characteristics and behavioral patterns we observe in great leaders. The comments captured much of what comes out of any discussion on leadership: a willingness to give associates autonomy to make decisions; an ability to inspire others and display the sense of inner authority that inspires trust; an ability to connect with and bring out the best abilities in the people being led; knowing how and when to listen; and a willingness to engage in the decision-making process to shape those decisions. What happened next was far from routine. Group and chapter member Steven Cerri built upon the conversation by describing a workshop exercise he often facilitates to help others become comfortable with themselves so they are more comfortable and effective in leading others. The exercise came out of neuroscientific and neuro-linguistic programming ideas about connections between mindset and physiology. Which, of course, raised the obvious question: “Can you run us through that exercise now?” And which then produced a much-appreciated response: Steven’s agreement to do exactly that in what was a beautifully effective spur-of-the-moment example of delivering just-in-time learning to a group of his own peers. What Steven did, in the space of a few minutes, was to encourage his eight peers to sit in comfortable positions, relax, and quietly observe what was contributing to that state of being in the world comfortably. Noting our own individual positions—whether we were sitting forward or leaning back, for example. And then thinking about how we might quickly slip into that physical posture at moments when we most needed that sense of being centered to respond to the needs of those we are leading. The learning continued as we debriefed the experience to note what Steven had produced among all of us: an increased ability to observe ourselves in ways we rarely do; an appreciation for the already strong spirit of cohesiveness among members of the group that made it possible for us to fully engage, spontaneously, in the learning opportunity Steven provided; and an awareness of the strength of this group of leaders in development—our willingness to work as peers in ways that quickly move us from theoretical to practical and personal engagement in whatever topic we are exploring. “Really effective leaders know how to adjust in real time to what is going on in the room,” Steven observed as the conversation was drawing to a close, and there’s no doubt in my mind that the example he provided will be one that sticks with us and serves us well in the months and years to come. N.B.—This is the second in an ongoing series about the ASTD Mount Diablo Chapter Trainers as Business Leaders group; for information about upcoming meetings, please visit the Chapter website at http://mtdiabloastd.org. “Congruence,” the contributors to Wikipedia remind us, “is the state achieved by coming together, the state of agreement,” and that proved to be a tremendously fruitful theme to explore at the initial meeting of Trainers as Business Leaders @Mt. Diablo ASTD recently. The Trainers as Business Leaders special interest group, sponsored by one of the two remaining chapters of ASTD (American Society for Training & Development) here in the San Francisco Bay Area—there are nearly 130 chapters across the United States—is built upon a firm foundation of helping Chapter members and supporters develop and hone their leadership skills in ways that serve the larger workplace learning and performance community. And while our initial discussion around the importance of congruence in leadership may not have resulted in complete agreement—after all, have any of us ever seen a group of trainers engage in a conversation where the resulting product was complete agreement?—the exchanges did produce immediate results. The small group of initial members agreed to hold monthly rather than quarterly meetings. The broad-based discussion around the role trainers play as leaders within the organizations we serve created a short list of books that we expressed interest in exploring on themes of leadership, collaboration, and even Neuro-Linguistic Programming. (Titles included Lead with LUV, by Ken Blanchard; NLP [Neuro-Linguistic Programming] at Work: The Difference that Makes a Difference at Work, by Sue Knight; and Thinking for a Change, by John Maxwell.) Participants walked away with a short list of ideas they could use in their own workplaces the day after that initial meeting took place. And participants even used a challenging situation one attendee summarized as a case study in how effective leaders might find creative and positive solutions to vexing workplace problems. What felt most promising about this gathering of workplace learning and performance professionals exploring and sharing thoughts and proposed actions on leadership was the way these current and prospective leaders modeled the very behavior they were promoting. One participant’s suggestion that “if you are defending a position, you are not hearing another one” reflected the overall openness of group members to exchanging ideas without displaying any inclination to debating those thoughts to score points at a colleague’s expense. The suggestion that “sometimes you don’t want to shut down people that you think are wrong” continued that theme of inspiring positive actions through collaboration rather than complete reliance on confrontation, and there wasn’t a word uttered during the 90-minute session that would have led to those with conflicting points of view hindering the conversation that took place. And the theme of seeking congruence between ourselves and the situations in which we work not only served as a foundation for positive interactions among the group’s members, but also became one of the themes that members proposed to explore within their own workplace settings in the days and weeks that followed that initial meeting. All of which suggests that members of this dynamic group of trainer-teacher-learners are well on the way to creating wonderful learning opportunities for a larger set of colleagues while modeling the behavior they are promoting. N.B.—This is the first in an ongoing series about the ASTD Mount Diablo Chapter Trainers as Business Leaders group. Information about upcoming monthly meetings is available on the ASTD Mount Diablo Chapter website at http://mtdiabloastd.org.